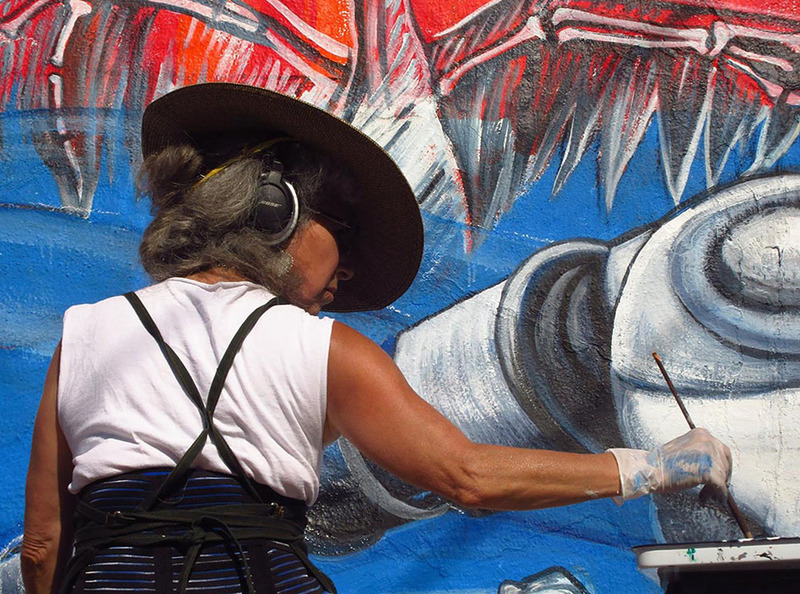 The expansion of a research center focused on Latino issues at UC Berkeley is being celebrated with the art of Juana Alicia, whose mural work has long been a fixture of Mission District walls. Both Juana Alicia and the Center for Latino Policy Research at UC Berkeley, where her work will be displayed through March 30, are dedicated to highlighting the multifaceted struggles of the Latino community in the Bay Area and beyond. Juana Alicia’s murals and paintings have explored themes like sovereignty, self-determination, and colonialism. “It’s an expansion of our new facilities and programming that integrates arts and humanities with our continued attention to social issues and policy,” said Professor Patricia Baquedano-López, chair of the Center. Among the more than 14 works featured in the exhibit are elements of her 2004 mural at 24th and York streets, La Llorona, which explores themes of water, globalization, and the role of women. Juana Alicia was also one of seven muralists who collaborated on the massive Maestra Peace mural that adorns the Women’s Building on 18th Street, a symbol of feminism. While the center’s focus remains on policy, its expansion from a few rooms to a whole building at 2547 Channing Way also makes it a place where art can be featured. The artistic element offers another way to call attention to the social concerns the policy center addresses. The exhibit, called Poetic Justice / Justicia Poética, opens with a reception 5 – 8 p.m. on Friday, March 3 at 2547 Channing Way, Berkeley. It is part of a month-long Open House titled Arts in Our Community: Latinx Visions for Social Justice.